Lee Scott lifts the Stan Oulds Cup. Boxing Day brought the first trophy of the season for Whitnash Town, with two late goals seeing off the challenge of Jaguar Daimler in the Stan Oulds Cup final. Despite an 11am start, Whitnash dominated proceedings at Coventry Copsewood, with goalkeeper Neil Stacey not having a save to make. However, Jaguar defended stoutly, aided by profligate finishing, to ensure the sides went in at the break level. Further chances went begging for Town after the break, while Lewis Currell stabbed the ball home after a goalkeeping error, only to see his effort chalked off for offiside. This was despite two defenders being stationed on the line. 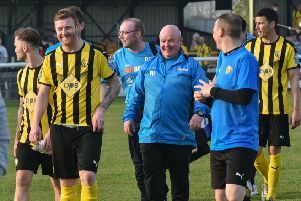 Town did finally make their dominance tell in the 80th minute when Mike Ellis played the ball into the the feet of Josh Cole. With his back to goal, the striker had plenty to do, but he produced a smart first touch to turn his marker in one move and then powered the ball into the bottom left-hand corner of the net. However, with a couple of minutes remaining, Jaguar lost their discipline and conceded a free-kick on the right edge of the penalty area. Craig Watkin then stepped up to whip a trademark free-kick into the top right-hand corner of the net and seal the silverware for Barry Shearsby’s side. And, after securing the first trophy of his reign, Shearsby is now hoping the success will act as a springboard to Coventry Alliance League success. “With the festive season and the timing of the kick-off, this could have been a potential banana skin final for us,” said Shearsby. “But we were far the better side from start to finish.